Backed by sound infrastructure, we are able to manufacture, supply and export best grade Resistance Temperature Detector and Indicator. 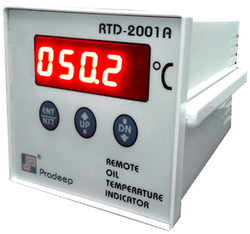 Under the offered range, we provide OTI RTD Pressure Temperature and WTI RTD Pressure Temperature. With an aim to ensure the high standards of provided temperature detectors, we manufacture these by making use of the optimum quality raw material, sourced from the most trustworthy vendors of the industry. In addition to this, we strictly adhere to globally laid quality standards while manufacturing these temperature detectors. Abiding by ethical business policies, we are engaged in offering RTD-OTI. We manufacture these temperature detectors by utilizing best grade raw material with the assistance of professionals. These professionals ensure that provided temperature detectors are made in accordance with the established quality standards of the industry. 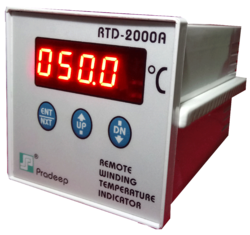 With the support of modern modern machinery and latest technology, we are engaged in offering RTD-WTI.We make use of only quality-approved raw material, sourced from the most trustworthy vendors in the manufacturing process of these temperature detectors so as to ensure their high standards. Along with this, our quality controllers monitor the entire manufacturing process of these temperature detectors so as to ensure their synchronization with industry laid quality standards. PT100 Sensor are constructed in a number of forms and offer greater stability, accuracy and repeatability in some cases than thermocouples.